How to calculate Pivot points? 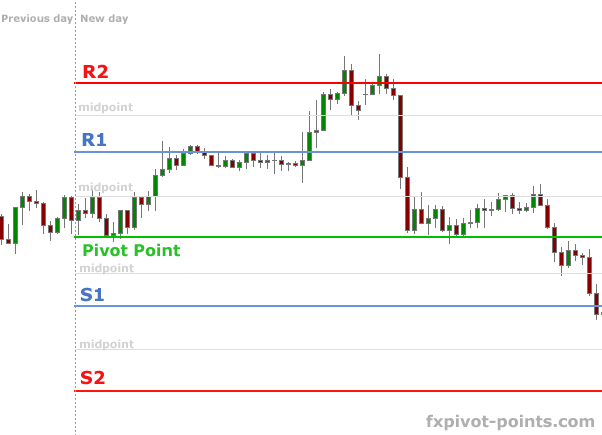 Pivot levels are derived from previous day High, Low and Close price values. Thus, every new day Pivot points must be reset using the newest data. As a rule traders take the time range from midnight to midnight, e.g. from midnight price bar to midnight bar. Later we will introduce some traders' tricks about the timing. There are also additional levels, such as R3, S3 — third resistance and support, as well as Mid-points — middle levels between the major levels. There are no limits on how many Pivot levels to use, however, one should remember, that making complex charts makes trading complicated as well. We would suggest sticking to 5 major Pivot point levels, around which most of the price action takes place.